The FFS 17 and a bit. – Dirty wet dog , boats and sailing. The FFS 17 and a bit. Down at the yard a few days back i was sat in the honesty cafe enjoying a coffee and one of Julia’s most excellent cakes when Chris the boss came in declaring that he was going to design the ultimate ‘revenge’ drawing board for naval architects : one that would be as awkward for the architect to work at as the end product is for the boat owner. 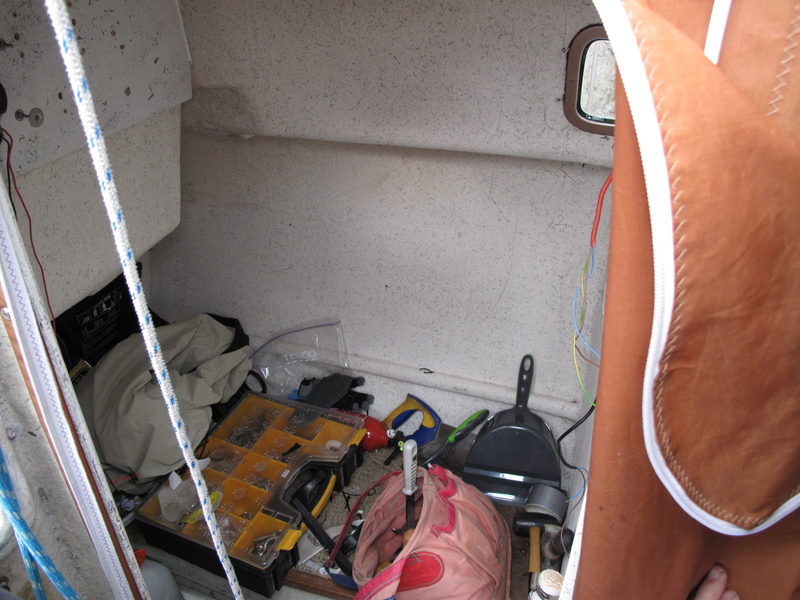 Anyone who has spent a lot of time around boats or worked on them will have their own maddeningly frustrating story’s of inaccessible corners , unreachable fittings and parts that always poke you in a tender spot while you are working. Where the ‘FFS’ comes in of course is from the urban and sailors street dictionary of standard language during ‘frustrating’ work sessions although i did once consider drawing the ultimate anti-design : the FFS 17 and a bit, for a magazine design competition. The design letter and number is of course a parody on the many OOD 34’s , S&S this that and the other famous designs but is an attempt to design the most awkward and annoying badly featured boat : the 17 and a bit for example is so that it can’t usefully be built from 2 panels of ply scarfed together but would maximally waste as much material as possible. Most of us could then describe every worst feature that they have found on any boat but throw them all into this one design : bunks that are too short and with a deck beam or half bulkhead exactly where your head is when you sit up…maybe a compass or other instrument in eaxctly the one place that would stop you getting comfortable in the cockpit ! and always so many odd little corners and spaces that are useless for storage but can be guarenteed to catch and snare any small screw or fitting dropped accidentally. And its not just the designer either : my Frances 26 was definitely a FFS 26 at heart and not entirely the fault of the designer, from the photo’s you can clearly see that she is a semi long keeled double-ender and that the rudder is hung conventionally on what would have been a timber sternpost in the original but is now a grp moulding : now the upper 2 rudder mounts which are visible are nicely bolted through the molding and backed up by plates and washers so it would be reasonable to assume that the lower mount was done the same way right ?…..well you would be wrong because what the total fuckwit of a boatbuilder did was to merely thread the 2 bolts through the GRP , oh and didn’t even put nuts on the back ! so some 30 years later that little error nearly sank the boat. I still remember the maybe best or worst one of these that i saw back in my boatyard days : memory has it as being the largest and i thought sexiest boat we ever had up on the hard ie a nicholson 55 which was a pretty seriously big boat in those days. What happened is that our yard was tasked with a major job on the engine and so the yard engineer decided that the only way it could be done was to lift the whole engine and gearbox assembly out. Now i don’t know the full details although i was drafted in at one point to work out ways of rigging lifting tackles inside the boat….you see the engine was mounted very low in an already deep-vee bilge and the shaft was all but impossible to get at, the engineer who was a big lad just couldn’t get anywhere near it, i seem to remember that we almost had to hang the smallest apprentice by his ankles in that space while he worked and then heave him out once in a while. That was nothing compared to the problem we then had getting the engine out : too large to go through either the companionway and impossible to get around the rig and get it under the main hatch : i seem to remember it coming out and going back in only in pieces. Don’t even get me started on the madly illogical things that boat owners then do to their boats in fits of misplaced enthusiasm : i think of them as the deserving FFS owners club. Couldn’t agree more the board should require the operator to hang upside down to operate it at the very least ! Edited to full version with some salty laguage.